We've previously featured an island of cats and an island of swimming pigs on this site. This time, it's an island of rabbits. 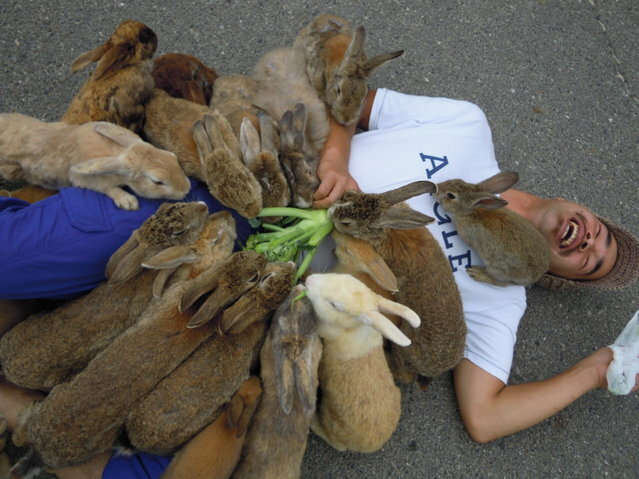 Okunoshima (or Rabbit Island, as it's inevitably known) lies in the Inland Sea of Japan, and is home to hundreds of tame bunnies, living off the generosity of tourists. But life on Okunoshima was not always so idyllic. In the early twentieth century, the Japanese army produced thousands of tons of poison gas on the island, which was removed from maps at the time to keep the location secret. The army brought a population of rabbits with them to test the poison. It is not known whether the current inhabitants are descendants of those first few, or of individuals brought to the island by schoolchildren in the 1970s. You can find out more, and see videos of the floppy-eared locals by clicking on the image below.